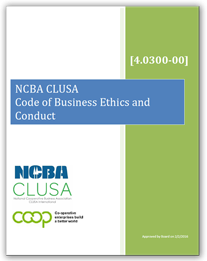 This Code of Business Ethics applies to all employees, members, Board of Directors, volunteers, consultants, and anyone acting on behalf of NCBA CLUSA. Each of us is responsible for adhering to the values and standards set forth in this Code of Business Ethics and Conduct (CBEC), for compliance with relevant organization policies and for raising questions if we are uncertain whether or not the standards are being met. Violations of the CBEC may result in a variety of corrective actions, and in some cases, may result in disciplinary action up to and including termination of employment.